There are some difference between New Suzuki Cultus 2017 VXR and VXL which are given as under. 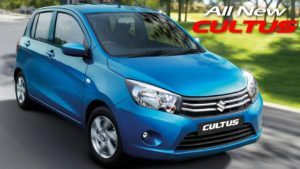 First and most important difference between both variants of New Suzuki Cultus 2017 is the price. The basic variant Cultus VXR comes in 1250,000 Pakistani rupees. New Cultus VXL which is high-end variant comes in 1391,000 Pakistan rupees. Hence the difference between VXR and VXL is about 141,000 rupees. New Cultus 2017 VXL comes with alloy wheels while VXR has steel Rims with wheel cups. Cultus VXL has power windows while VXR comes with old style handle through which you have to pull the mirror up or down with your own hand. Suzuki Cultus VXL has modern Anti-Lock Braking System (ABS) while Cultus VXR has simple brakes. Presence of Dual Air-Bags is the most important difference between both variants of Suzuki Cultus. Suzuki Cultus VXL comes with this latest safety feature but VXR don’t have this feature. Dual Air-Bags means it has air bags not only for driver but also for passenger on front seat. VXL comes with stylish front fog lights while simple Cultus doesn’t have fog lights. These above-mentioned are the differences between Suzuki Cultus VXR and VXL. Overall New Suzuki Cultus 2017 is perfect hatchback car but with high price tag we will have to wait for the response of Pakistani customers. Cultus VXL ki price 11 lakh honi chahe. Aur VXR KI 10 lakh tak honi chahe . Jo har customer buy kar saky , warna tu har cutomer ye gari buy karny k bajay Honda city buy kar sakta esi price mai . New cultus price is very high we can purchase easily more facilitated cars than cultus in this price. Suzuki company has to reduce the price a little bit if want to sale this car in pakistan. too high price to buy. be practical and think economically. iss ki kemat 15 lak honi chahye. VXR should have ABS at least for safety driving, if not other features. Costly …price of vxl should b 1250000 ..
Passo and vitz are available in same price then why to purchase cultus? These two cars are far better than cultus. New Cultus price is very high. Pak Suzuki Motors Co. making fool to Pakistani nation because anyone can compare the price with respect to their specifications with Japanese assembled cars, surprisingly those cars are more economical and advanced in features as well. Everyone Just give them shut up call to buy such substandard and over priced vehicles. As both VXR and VXL have prominent difference. but still the price is very high. moreover, it is local made.in my view VXR price would have 1050000 and VXL would have 1200000 because in such price people can easily buy Japan made vehicles. New Cultux is looking good but price is toooo much high as vXL should be around 12 lacs. As a feedback company must look into this matter and reduce vehicle price. High price, will definitely go for some other car. the price is very high. moreover, it is local made.in my view VXR price would have 1050000 and VXL would have 1200000 because in such price people can easily buy Japan made vehicles. Due to high price their some models are super flop like Liana Kazaish New Cultas. Cultus VXL is very expensive, In this price get big car. Can I get suzuki ravi in eminent blue color from suzuki company pakistan? Vxr ya vxl main se kisi main b power steering ni ha kea???? Yar koi bta sakta ha k cultus 2017 vxl or honda city ma milage kitna diffrence ha matlb kon zayda petrol khaye ge. SIR VXL Main Power steering hy…? Mujay koie bata sakta hai ke Suzuki cultas VxL or AGS me kiya farq hai? Price should not more than pkr. 1000000/=. Yes I agreed the prices of both VXL & VXR are veryhigh one middle class like me can not afford . Ironary is this all of sudden the price of both catogaries have been increased by rs. 40000 with effect from 1st August 2018 although Suzuki motors increased the prices in June 2018. There is no justication. Plz think it.